The ancient city of Agrigento is not far from the seaside: most locals enjoy a day at the sandy beach of Porto Empedocle to freshen up during the warmest days of the year. However, there is another beautiful seaside destination, just a few minutes from Porto Empedocle, particularly impressive and scenic: it’s the Scala dei Turchi (Turkish steps), a white rocky cliff made of marl located between two sandy beaches that can be reached through a staircase-shaped limestone rock structure, which is where its name comes from (the reference to Turks probably comes from their common raids in the area in the ancient times). Located in Realmonte, Scala dei Turchi is nowadays one of the most interesting destinations in this area of Sicily’s coastline for several reasons, first of all its spectacular shape and color, as well as the breath-taking panoramas you can enjoy once you reach its top – the colors at sunset are just enchanting. Moreover, marl being a clayish rock, visitors can often be found covered in clay, whose well-known properties are particularly good for the skin (in this area you will also find some of our family villas in Sicily, take a look!). Going West from Realmonte, the seashore is mainly sandy: we recommend a visit to Eraclea Minoa, an ancient Greek city whose remains can be found in an archaeological site in the district of Cattolica Eraclea, not far from the Platani river mouth Nature Reserve, a lovely protected area with a remarkable variety of flora and fauna, as well as pretty sandy beaches with clean waters and immersed within a very peaceful environment. One of the most famous and lovely destinations of south-western Sicily, Sciacca is a vibrant and lively seaside destination rich in history, culture and traditions. The sulphurous springs from Mount S. Calogero, in the background of the town, have been taken advantage of since the foundation of the city, back in the 5th Century b.C., when the Greeks built it as a thermal destination for the inhabitants of Selinunte (an ancient colony, nowadays a huge must-see archaeological park rich in great temples and other outstanding evidence of the Greek presence in the island). The layout of the city still recalls its original Medieval structure, and its historical centre still boasts plenty of remarkable works of art, from the city walls to the churches of SS. Maria del Soccorso, with beautiful Norman archways and prestigious statues from the Renaissance, and of San Domenico with its convent; two castles were built in the city, and beautiful palaces can be admired all over the city centre. 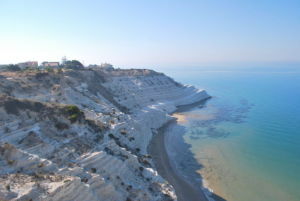 Beaches near our Sciacca villa rentals are sandy and well equipped, perfect for families, or rocky, such as the “Stazzone” area, where the sea is particularly clean and surrounded by picturesque restaurants, pubs and cafés. The city proudly maintains a centuries-old tradition of carnival, one of the most outstanding in Sicily.